Nevada hangin out on the climbing log in the LTWC bobcat cage, which is where most of the bear cubs are housed initially. In August, Lake Tahoe Wildlife Care experienced a first that it never wanted to experience: the death of a bear cub. About three weeks later, a second cub died at LTWC. The sad and somewhat mysterious events came as a shock, said Tom Millham, who started LTWC with his wife Cheryl around 40 years ago. In the 17 years they’ve been taking in and caring for bear cubs, the Millhams have never lost one. 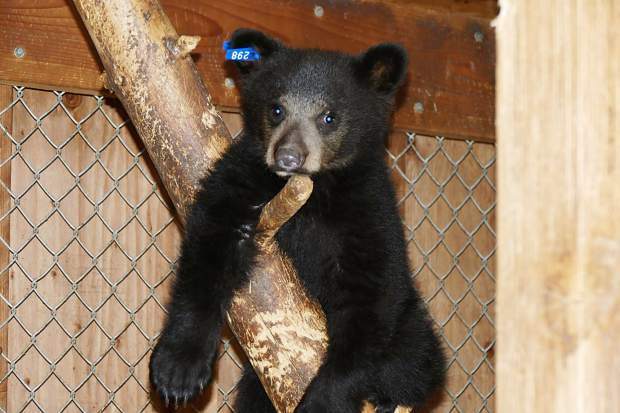 Nevada, a cub who came to LTWC in May after being discovered in the Nevada City area, died Aug. 28. Another cub, Filmore, started showing signs of illness the morning of Sept. 15. The next morning the cub was dead. “This is unprecedented in the history of LTWC, and we are anxious to determine what caused the tragic deaths of two young bears so we can prevent anything similar from happening in the future,” read an early-October Facebook message posted by LTWC, a nonprofit that rehabilitates and releases orphaned and injured animals. While many questions remain, exhaustive efforts have shed some light on what happened to the young bears. Microscopic tissue testing revealed the presence of adenovirus, a family of viruses that can affect humans and animals, depending on the type. At the moment, officials speculate that the bears succumbed to a canine form of adenovirus, although that has yet to be verified. It’s not unheard of for adenovirus to be detected in bears, but it is somewhat unusual, said Brandon Munk, a wildlife veterinarian for California Fish and Wildlife. For perspective, Munk said he believed the last published account of adenovirus in bears was published in the 1980s. Canine adenovirus is a type of illness that is taught in veterinary school, but rarely observed in the field. That factor may have contributed to the difficulty in detecting the illness. When the first cub died, the body was sent to California Fish and Wildlife for testing, according to Millham, who added that the test did not turn up a possible cause. When the second cub died, its body was sent to UC Davis where officials determined the cub was sick with an adenovirus. Blood samples from the other four remaining cubs at the Lake Tahoe center — LTWC received eight bear cubs this summer, two of which were released — were sent to Cornell University. Those tests came back positive for adenovirus, according to Millham. California Fish and Wildlife has worked with local veterinarian Dr. Kevin Willitts, who volunteers as LTWC’s vet, to quarantine the four remaining bears in order to limit their exposure to and from their enclosure. As of Monday, Oct. 9, Millham said all the bears are “acting normally” and have not displayed any negative health implications. LTWC has cared for 96 bears over the years and never had one die on its watch. That fact has made the past couple months difficult for the LTWC family, Millham said. As the Millhams and volunteers take the necessary precautions in the continued care for the remaining cubs, others are trying to learn more about the case. First and foremost, they want to learn if the bears were infected with a canine adenovirus. “It’s an interesting case and worth pursuing,” Munk said.